August 5, 2014 - We all make the same mistake. When traveling through history, we tend to shorten time and lose perspective, often turning centuries into decades and decades into years. Perhaps this is the reason why so many Americans still confuse the totally justified Texas War of Independence from Mexico and the totally unjustified Mexican-American War almost a decade later. 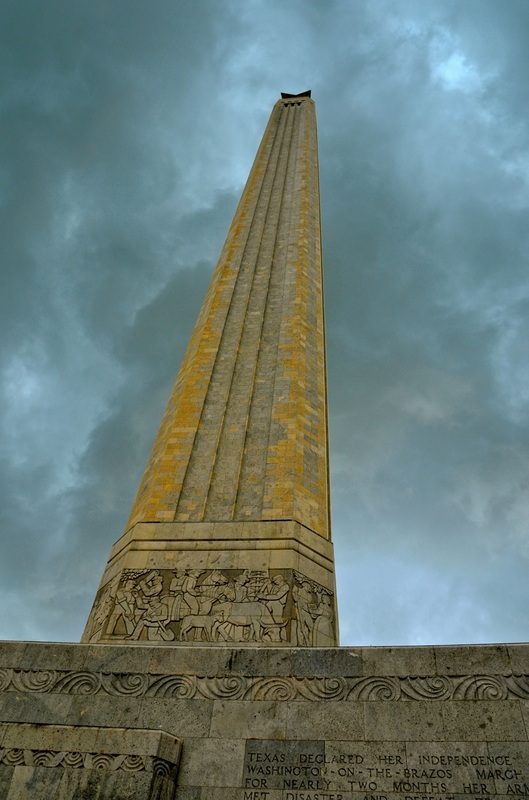 Even at the San Jacinto Monument and Museum, the site where the justified war was won in 1836, visitors are misled into lumping the two wars together. 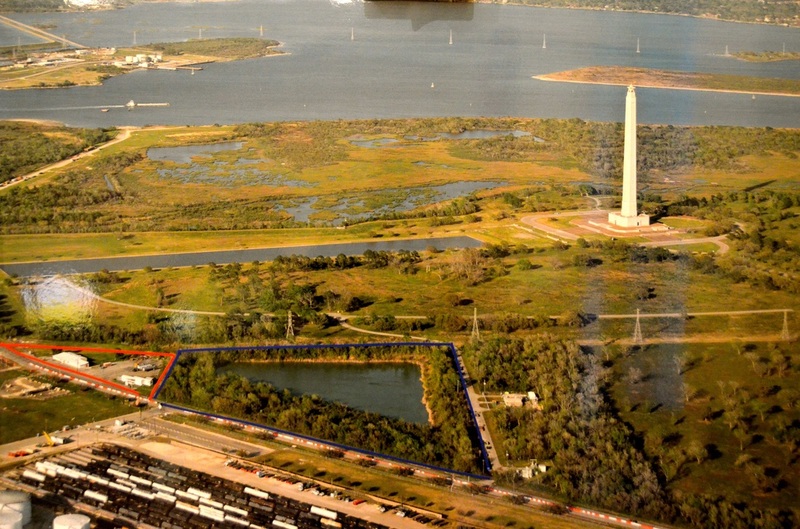 While the Battle of San Jacinto had huge historical significance — making Texas an independent nation and eventually part of the United States — the monument unnecessarily tries to hype its own significance by tying itself to U.S. land acquisitions that occurred many years later. 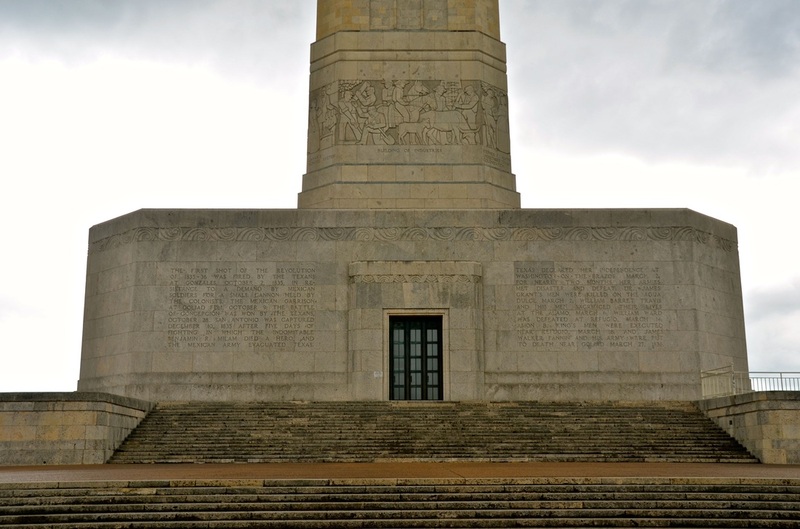 "Measured by its results, San Jacinto was one of the decisive battles of the world," notes one of the eight huge inscriptions on the exterior of the monument. 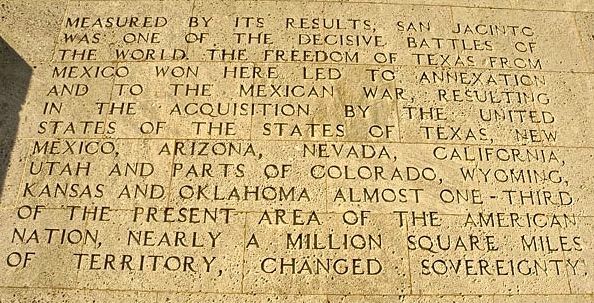 "The freedom of Texas from Mexico won here led to annexation and to the Mexican War, resulting in the acquisition by the United States of the states of Texas, New Mexico, Arizona, Nevada, California, Utah and parts of Colorado, Wyoming, Kansas, and Oklahoma." 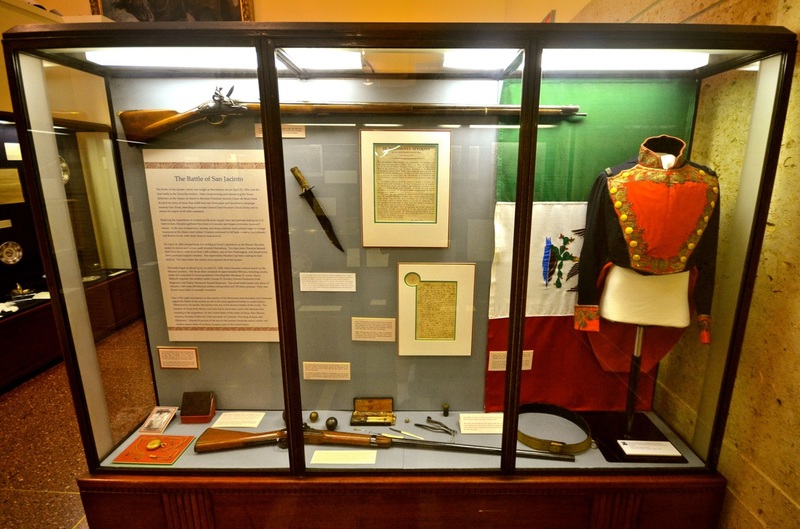 Taking credit for all the Mexican land acquired by the United States after San Jacinto, the museums exhibit also boasts, "almost 25 percent of the area in the present American nation, nearly one million square miles, became part of the United States." Why a justified battle and war would want to take credit for the spoils of another war that was totally unjustified and occurred a decade later is beyond me. 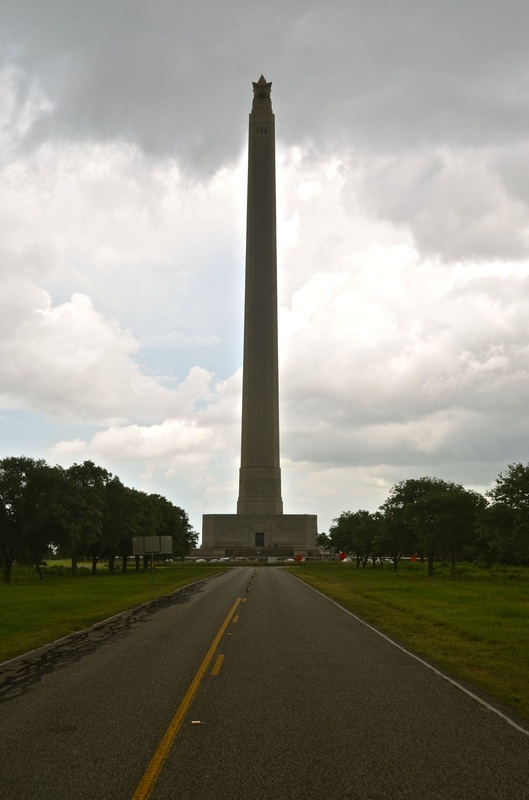 But that's what I found when my Great Hispanic American History Tour visited the very impressive obelisk — taller than the Washington Monument — just east of Houston. Some background: The Battle of San Jacinto, fought for 18 minutes on April 21, 1836, was the final battle in the Texas Revolution. This was the battle that finally avenged the 13-day siege and overpowering massacre at the Alamo, where at least 187 Texans were killed. This is where General Sam Houston's 900-men Texan Army defeated Mexican President Antonio Lopez de Santa Anna, who had become a dictator — the self-proclaimed "Napoleon of the West" — and was rightfully opposed by anyone who valued freedom. This was where only nine Texans were killed, but the Mexicans suffered 630 casualties and 730, including Santa Anna, were taken prisoner. This is where Texas became an independent nation, until it joined the United States as the 28th state on Feb. 19, 1846. At the Alamo, the Texans had suffered a military defeat but scored a huge psychological victory. After the casualties were counted, and everyone saw that about eight Mexican soldiers died for every Alamo defender, "Remember the Alamo" became the battle cry of the Texas Revolution. 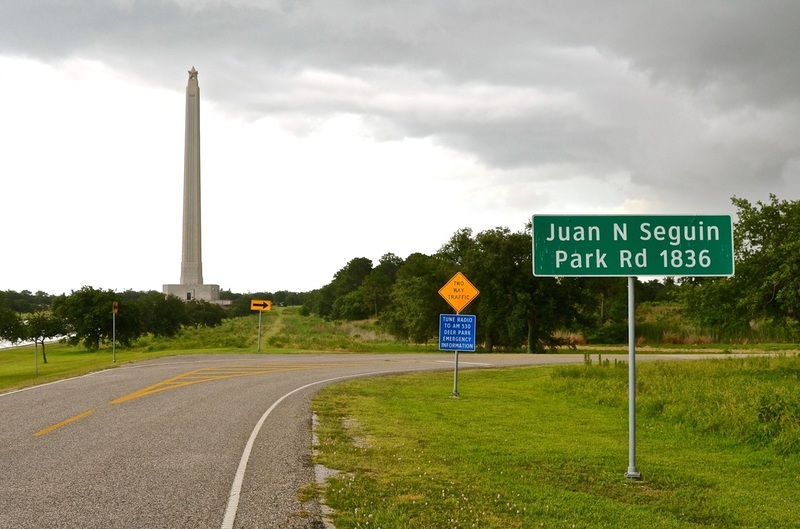 San Jacinto was a justified freedom outcry, the natural response to Santa Anna's despotic decrees. But it had little to do with the Mexican-American War, an orchestrated land-grab by the United States under the absurd pretext of "manifest destiny," two words that gave this country the insolent right to invade and grab territory with the same impunity recently seen when Russia annexed Crimea. It was opposed by many Americans, including then Illinois Congressman Abraham Lincoln, who questioned President James K. Polk's pretext assertion that Mexico had "invaded our territory and shed American blood upon American soil." Polk prevailed by unjustifiably reaching back in time and — as if the victory over Mexico at San Jacinto 10 years earlier had not been enough — shamelessly charging, "The grievous wrongs perpetrated by Mexico upon our citizens throughout a long period of years remain unredressed ... the two nations are now at war." While the Mexican-American War was perhaps the worst example of American imperialism — the overpowering of a neighboring nation just because we were stronger and needed to expand our territory — San Jacinto was the outcome of an admirable struggle for freedom. While the Mexican-American War pitted the United States and Mexico along ethnic lines, Hispanics fought on both sides during the Texas Revolution. When xenophobic firebrands still cry out, "Remember the Alamo," as a battle cry against Mexicans and other Hispanic immigrants, or when they express unfounded fears that Latinos are plotting a "Reconquista," they are apparently too ignorant to understand that many Hispanics fought on the side of Texas. 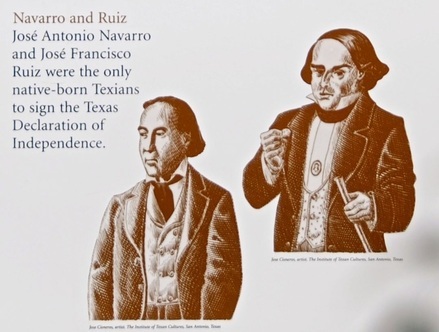 They must not know that along with famous heroes such as Davy Crockett, James Bowie and William B. Travis, there were Hispanics — Gregorio Esparza, Juan Antonio Padillo, Toribio D. Losoya, Jose Maria Guerrero, Antonio Fuentes, Juan Abamillo — who also died fighting Santa Anna and defending the Alamo. 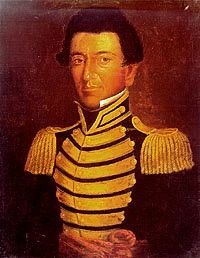 People forget about Juan Seguin, the Latino who — because he was able to speak Spanish — was dispatched through enemy lines as the last courier from the Alamo, seeking reinforcements and carrying the message that the Texans "shall never surrender or retreat." When Seguin managed to get back to the Alamo with a few reinforcements, it had already fallen to Santa Anna's army. But he went back to join Houston and played a significant role in the Texan victory at San Jacinto, where he commanded a regiment of the Texas Volunteers. 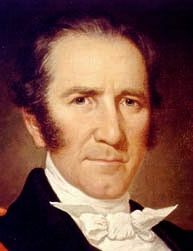 People forget that Seguin directed the burial of the ashes of the slain Alamo defenders in 1837. "Yes, my friends, they preferred to die a thousand times than to live under the yoke of a tyrant," Seguin told mourners in his eulogy. "I invite all of you to join me in holding the venerable remains of our worthy companions before the eyes of the entire world to show it that Texas shall be free, and independent, or to a man, we will die gloriously in combat toward that effort." People forget that Seguin went on to become mayor of San Antonio, and that as a Texas senator, he supported legislation to protect the interest of native Texans who were being overrun by American immigration and becoming a political minority. People forget, or perhaps they never knew, that several Latinos were among the signers of the Texas Declaration of Independence, including the only two native-born Texans who signed: Jose Antonio Navarro and Jose Francisco Ruiz. 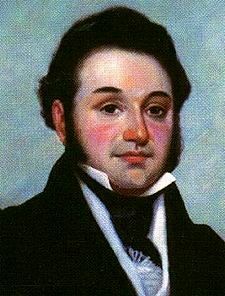 A third signer was Manuel Lorenzo Justiniano de Zavala y Saenz, born in Merida, Yucatan, a Mexican of Spanish decent who went on to become the first vice president of the Republic of Texas. His devotion to Texas' freedom is still quoted on T-shirts: "If I knew my death would assure the liberation of Texas," de Zavala said, "I would not live another hour ... "
De Zavala had been a Mexican politician, serving in several important positions, including finance minister. 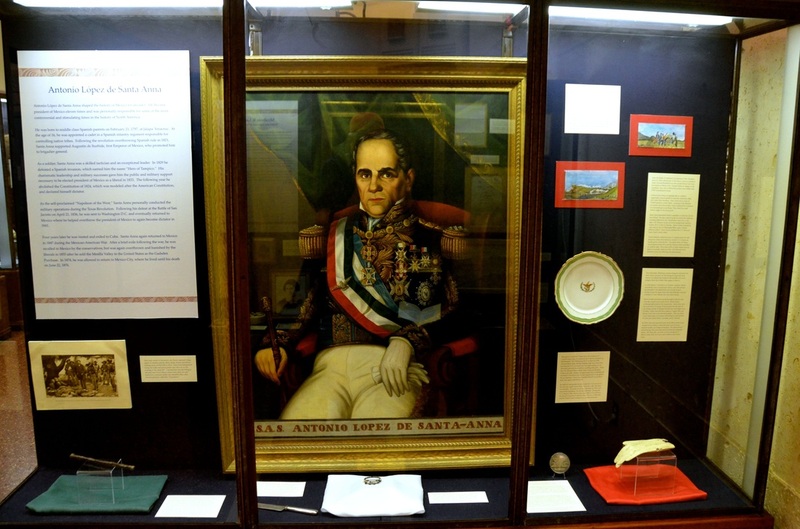 He was in Paris, serving as Mexico's minister to France, when he learned that Santa Anna had repealed the Mexican Constitution of 1824 and assumed dictatorial powers. He denounced Santa Anna, resigned his commission and joined the Texas independence movement. Santa Anna considered him one of the main instigators of the Texas Revolution. As a Texas politician, de Zavala, like Seguin, undoubtedly would have been a defender of the rights of Hispanics in Texas. 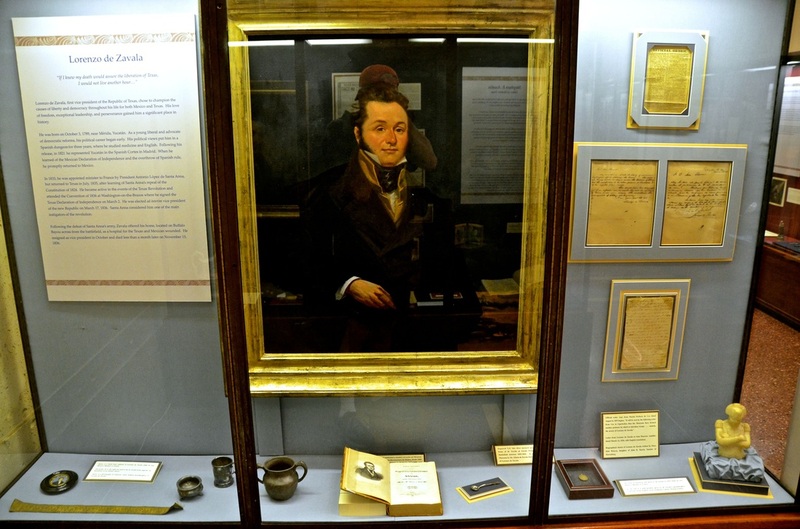 But unfortunately, because of failing health, he only served as interim vice president from March to October of 1836. He died of pneumonia less than a month after his resignation. But according to an exhibit in the San Jacinto Museum, "his love of freedom, exceptional leadership and perseverance gained him a significant place in history." Unfortunately, following the war, the new republic began to discriminate against Hispanic settlers. The new Texas Constitution denied citizenship and property rights to those who had failed to support the Revolution, and all Hispanics were assumed to be in that category — unless they could prove otherwise. Hispanics were rapidly relegated to second-class citizenship — socially, politically and economically — and many were forced to leave the area. This is why my Great Hispanic American History Tour needed to make a stop at San Jacinto, not to see the monument take credit for an unjust war that came much later but to unearth that buried portion of American history that shows many of the patriots who fought and died for Texan independence also were Hispanics, and to also show that Hispanics were poorly repaid. 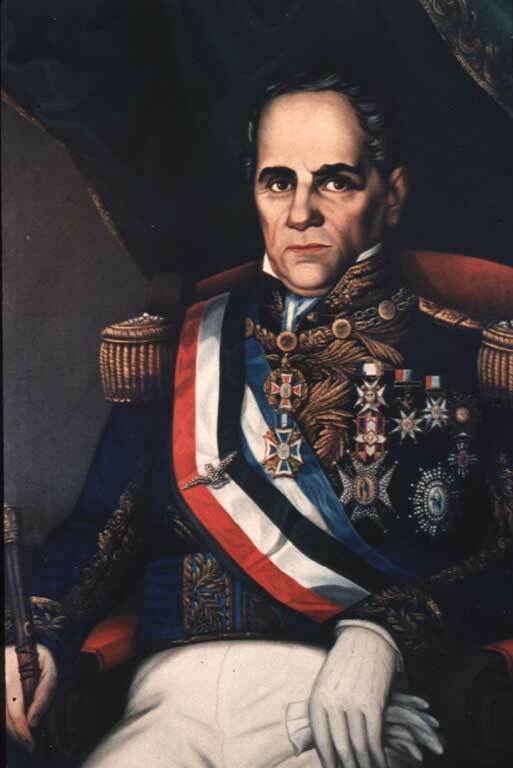 Nevertheless, because Santa Anna was allowed to return to Mexico, where he overthrew another president and again became dictator in 1841, and because both the 1836 and 1846-48 wars involved Santa Anna and Mexico, these two American land gains are often confused or lumped together as if it all had happened at the same time. Yet, I find that extracting compacted history unveals hidden Hispanic heritage. Next week, the Great Hispanic American History Tour goes to San Antonio, where we also must "Remember the Alamo" was a Spanish mission.